Here is my card for the challenge over at Pins. The girl image is from Fresh Brewed designs. The tree, wreath and deer are from the Silhouette store. 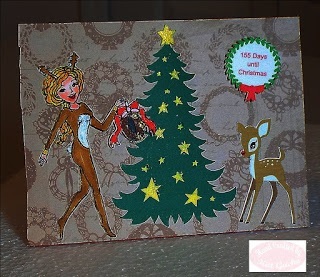 Only 155 days left until Christmas at the time I hand crafted this card. I used Chameleon markers to color and Stickles Diamonds to add some sparkle to the stars. Thanks for stopping by and leaving your comments. Have a happy crafty day.